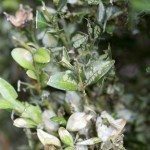 I have boxwood shrubs that suffer decliners due to winter cold or wind. What is a good fertilizer to feed them and when should I feed them? I live along the coast of North Carolina. There is no regular fertilizer guideline for Boxwood. The most reliable guide is a soil test to determine if there is a Nitrogen deficiency. The first signs of a deficiency is yellowing leaves, generally will start on the bottom branches and work it's way up. If you determine that your plants need a fertilizer, use a granular urea 10-6-4 or something similar. Scatter around the drip line as this is where the most active roots are. Do not over fertilize, as this can lead to root burn.